Calculations of density distribution show how the extended single-lattice wave-function (top) may be altered so that density is localized at "beat" points (bottom) where the primary and perturbing lattices interfere constructively. ABOVE: Two small circular mirrors (not dusty when taking data) are placed underneath the vacuum chamber. Each transfers one of the perturbing beams, at slightly different angles, into the BEC area via windows at the bottom of the trap. The primary lattice beam enters from another direction. LEFT: The lattice trap is suspended inside the high-vacuum chamber. The rubidium gas is cooled to near absolute zero and slowed by collision with specially tuned photons from beams of laser light that surround the atoms in six directions. The fastest-moving atoms are allowed to escape. The remaining atoms are confined in the desired location with magnetic fields produced by coils (reddish-orange in the photos above) on either side of the vacuum chamber. The resulting near-motionless cluster forms the condensate, which is held toward the bottom end of the trap shown at left. 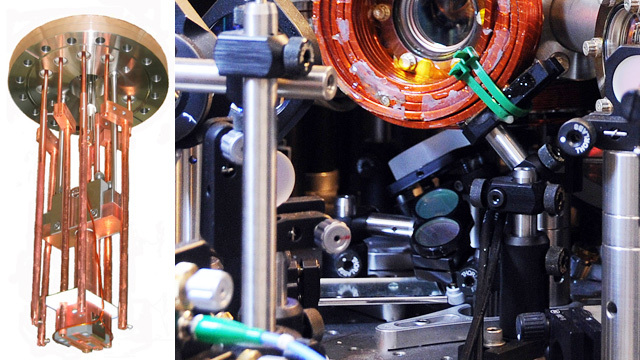 The experimental apparatus surrounds a high-vacuum chamber -- the gray t-shaped enclosure at center of photo -- that contains the ultracold rubidium atoms in a trap (shown on next page), with numerous ports for laser-beam inputs. After the lattice beams are slowly shut off and the trap is released, a camera mounted on the far side of the table records an image of light that passes through the expanding cloud of atoms, indicating areas of highest and lowest density. JQI researchers have discovered a surprising phenomenon, akin to a phase transition, that occurs when atoms cooled into a Bose-Einstein condensate (BEC) are placed in an optical lattice produced by a single laser beam and then exposed to an extremely weak perturbation from one or more additional beams. The presence of the perturbing beam/s causes a dramatic change in the density distribution of the atoms in the BEC -- much more than would be expected from the small magnitude of the perturbation. The result provides a striking new insight into large changes in the ground state of a system due to a small amount of disorder. “People are very interested in phase transitions, where the state of a system goes from one sort of behavior to another sort of behavior,” says Matthew Beeler, a graduate student supervised by JQI Fellow Steve Rolston. “What we’re studying [with BECs in lattices] is a transition from an extended state -- meaning that the density of the atoms is spread out -- to a localized state where the density is congregated in a few places.” That transformation, Rolston’s group found*, is controllable by varying the characteristics of the additional weak laser beam/s superimposed on the “primary” lattice beam. BECs can form when a group of trapped atoms is cooled to a fraction of a degree above absolute zero. Confined in that condition, most of the atoms “condense” into the same, minimum-energy quantum state. The JQI group starts with a cloud of about 10,000 rubidium atoms in a high-vacuum trap that uses magnetic fields and gentle nudges from light beams to quiet the atoms until they eventually condense into a space approximately 10 micrometers wide (about one-tenth the width of a human hair). The trap is constructed such that the BEC forms about 2 mm from a mirrored surface. The researchers then shoot a single infrared laser beam through the BEC. It strikes the mirror and reflects back on itself, forming a standing wave pattern. The atoms in the BEC “feel” the differences in potential energy created by the lattice beam, and arrange themselves into a density pattern that minimizes the energy of the BEC-lattice system. 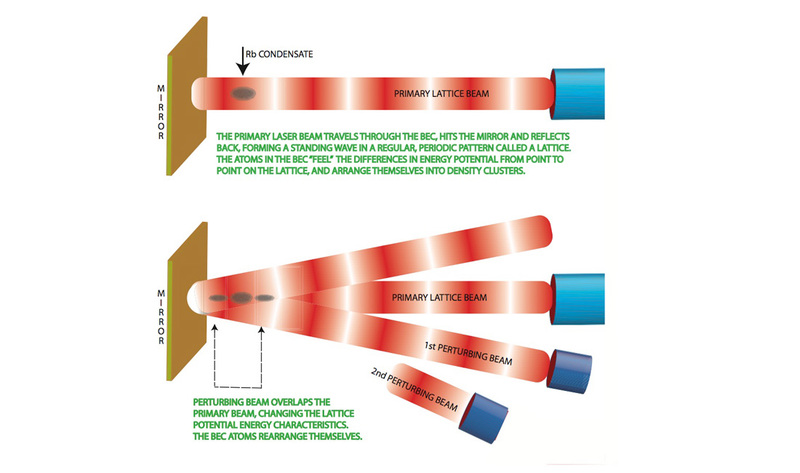 For most beam strengths, if the lattice beam is slowly turned off, the BEC returns to its initial lowest-energy, “ground-state” configuration after a few millionths of a second. The second beam has basically the same wavelength as the primary. But it is projected in at an angle, so when the two beams overlap, their periods are substantially out of synch. As a result, their lattice structures are “incommensurate” -- that is, they are out of phase by an amount that cannot be expressed in a ratio of integers such as 4:3 or 10:9. 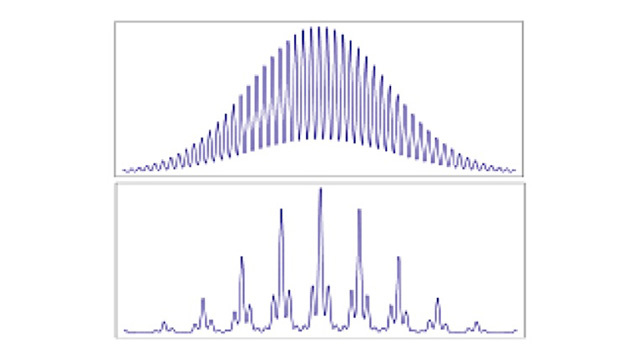 This imposed disorder prompts a drastic change in the cluster density pattern of the BEC atoms (see figure, page 1) that is far in excess of the result that would ordinarily be expected from the small extra energy in such a weak beam alone. Instead of being extended in space, the atoms become “localized” into separate clusters. Adding a second perturbing lattice changes the density distribution of the system yet again. Those disproportionate effects indicate that the perturbing lattices have had a considerable impact on the wave function -- the quantum-mechanical description of the overall state of the atom-and-beam system. Rolston’s group used theoretical equations to calculate the degree of alteration in the atoms’ density patterns that should occur under various scenarios. The predictions were a good match with the observations -- up to a point. But the experimental values began to diverge substantially as a second perturbing lattice was added to the original and as the power of the lattice beams was increased. Of course, the density distribution in the tiny BEC cannot be observed directly. (A beam of light sent in to take a measurement would alter the system.) So the researchers use an indirect method: They turn off the lattice beams and the trap potential. As the atoms start to expand, a camera takes a picture of the atoms’ momentum distribution after 20 milliseconds. The distribution reflects the initial density arrangement in the trap. 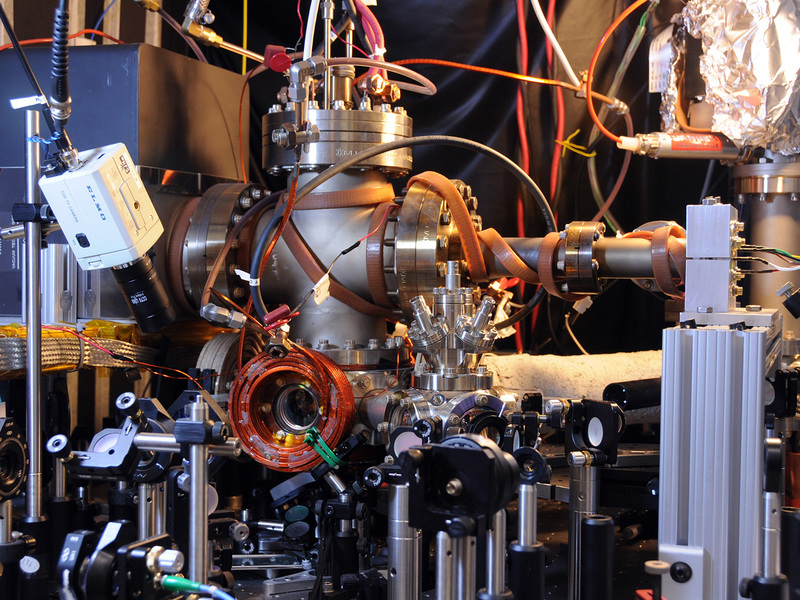 The experiment illustrates the value of using arrangements of ultracold atoms to introduce controlled, reproducible degrees of disorder into a condensed matter system. Those effects are difficult to study systematically in other contexts. “There’s always some amount of disorder in condensed matter systems,” Beeler says, and the sources may be hard to account for, owing to the numerous possible variables involved. Atomic systems, however -- such as the arrangement in the lattice experiment -- have much less intrinsic disorder and permit specific kinds of manipulation and adjustment of single variables.